The national liberation movement of Western Sahara, Frente Polisario, sent out a press release after the vote in the European Parliament of 16 Janaury 2019 regarding a new trade agreement that covers occupied territory. The below release was issued by Polisario on the afternoon of 16 January 2019. [BRUSSELS, 16 JANUARY 2019] Today the European Parliament voted to ratify the EU-Morocco agricultural agreement, including the territory of Western Sahara; illegally occupied by Morocco. We unconditionally reject this agreement as it plainly violates both EU and International law; fails to secure the consent of the Sahrawi people, and threatens to undermine the UN Peace Process. Our legal team are finalising preparations to immediately challenge the agreement at the European Court of Justice. The ECJ ruling of December 2016 established clearly that Western Sahara is separate and distinct from Morocco, a territory not under the sovereignty of the kingdom. Critically the Court made clear that the EU-Morocco agreements including Western Sahara are not valid unless the Saharawi people, whose only legal representative recognized by the UN is the Frente Polisario, give their consent. The Commission have demonstrably neither genuinely sought nor obtained this consent. Since December 2016, Morocco’s allies within the EU have sought to force through this illegal agreement; in spite of the overwhelmingly evidence that such an agreement would violate EU law, and prejudge final outcomes of the UN Peace Process. This narrow approach is only possible by the European Commission’s complete disregard for the appalling Human Rights situation under Morocco’s brutal, illegal occupation, and the deliberate disenfranchisement of large parts of the Sahrawi people. We are appalled, and unequivocally condemn this narrow, cynical, and counter-productive approach. This agreement has been marred by serious questions over its legality, and the deeply questionable conduct of its biggest proponents. The rapporteur for the deal on the Parliament’s International Trade Committee, Patricia Lalonde MEP, resigned following a major conflict of interest with her serving on the board of directors for a notoriously pro-Moroccan organization (EuromedA), she was pushed to resign only a few hours before the vote on her report to the INTA Committee on the 10th December, without any inquiry or change to the substance of her report. - 1/3 of the territory of Western Sahara and the 175,000 Sahrawi refugees were totally ignored. Moreover, the claimed "benefits" for the local population of the tariff preferences granted to products from Western Sahara has no relevance to the requirements of the ECJ, for which "a treaty must neither harm nor benefit third parties (such as the Saharawi people) without their consent." 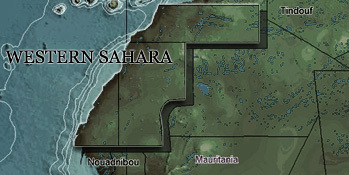 Morocco occupies militarily and illegally 2/3 of the territory of Western Sahara; it ilegally exploits the resources to the detriment of the Saharawi people whose right to self-determination - which implies its sovereignty over its natural resources, is quashed by Morocco with the complicity of the European Union. By encouraging such violations of the rights of our people, with unconditional support from a UN Security Council Member, the European Union sends a deeply concerning message about its commitment to human rights, fundamental freedoms, and its commitment to a UN Peace Process. This agreement undermines the EU principles and values, and further entrenches a status quo the United Nations, United States, and Germany have made clear must change. The passing of this trade agreement will unquestionably embolden Morocco in its uncompromising attitude towards the UN peace process. The efforts of the Personal Envoy of the UN Secretary-General, Mr. Horst Köhler, to finally reach a solution that allows the self-determination of the Saharawi people are now presented with another major obstacle in the shape of the EU. At a time when prospects opened with the meeting of the parties of the conflict in Geneva on December 5th and 6th, this agreement cleary signals that the EU is not seriously committed to the UN Peace Process. The Saharawi people, represented by the Polisario Front, will not hesitate to resort to justice at the right time in order to successfully annul this illegal and dangerous agreement. In the meantime, the Polisario Front wishes to express its gratitude to all those in the European Parliament who stood up for human rights and international law today by opposing the agreement.